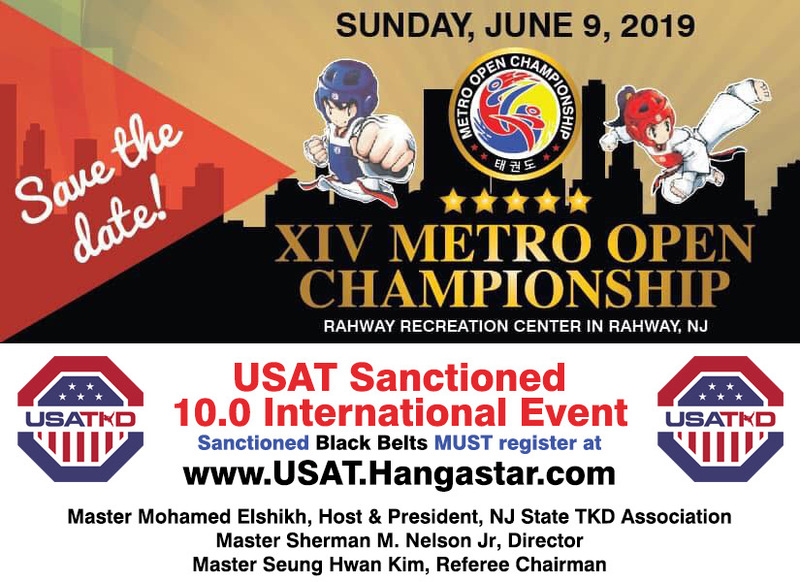 The 14th Annual Metro Open Championship will be held on Sunday, June 9, 2019, at Rahway Recreation Center, located at 275 E Milton Ave, Rahway, NJ 07065. All Black Belts athletes ages 8 and up from the USA and abroad will be eligible to earn ranking points with USA Taekwondo. This event will feature Gen 2 Daedo PSS for all 10-32 Black Belts. Also pleased to announced this event will be run by some of USA TKD’s elite, Master Seung Hwan Kim, Referee Chair, and Master Sherman Nelson, USA TKD Coach. We are looking forward to bringing this awesome experience to the tristate area. See you all there! For questions, please call Master Mohamed Elshikh, President of New Jersey State Taekwondo Association, at (732) 208-2020.